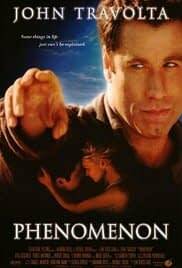 Physically, George (John Travolta) was staying absolutely the same, but the “phenomena” affected him internally and changed the world around him. The plot revealed such paranormal things as psychokinesis, super-fast learning, enormous operational power, fatigue-free, upgraded vision with understanding of things in depth, synergy with nature, etc. The story reveals that ALL THINGS have ENERGETIC origin and belong to the law of ENERGY. As such, everything could be observed, analysed, changed, etc. on the ENERGY level (widely used in the PRANA-healings methodology; unfortunately unknown by most of the Western-world). The movie’s watcher sees an amazing partnership of the protagonist with all things around. At the end of the movie, you will ask yourself if you would prefer to live a long but ordinary life or rather to enjoy the “phenomena” and have a very saturated but shorter existence as the protagonist did.